* The gForce that is necessary to register as shake. * Must be greater than 1G (one earth gravity unit). // gForce will be close to 1 when there is no movement. I get a warning in Eclipse about the sqrt on line 50 of the code above saying “Use java.lang.Math#sqrt instead of android.util.FloatMath#sqrt() since it is faster as of API 8”, but I choose to ignore it. * device has been shook. Take care of any missing import statements (ctrl+shift+o in Eclipse). 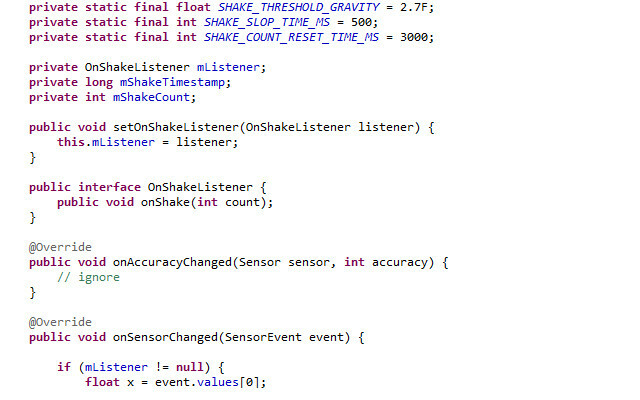 Create your own handleShakeEvent method to do what you want when a shake is detected. Or, remove the stub reference to handleShakeEvent(count); in the code above and create your own method or add what you want in its place. There you have it. I hope this helps! Thanx a lot. Very useful code. I just added thread to accumulate the number of shakes to work with a sum of shakes not a series.